The Country Music Marathon came to Nashville in 2000 – the Half Marathon was added in 2002. From less than 6,000 runners the first year, the event has grown to approximately 30,000 registered runners. If you live in Middle Tennessee and you’re a runner and you haven’t run Country Music, you owe it to yourself to give it a try. Even if your regular runs are much shorter than half or full marathon distance – that’s what training is for. A quick internet search will find a variety of training programs. 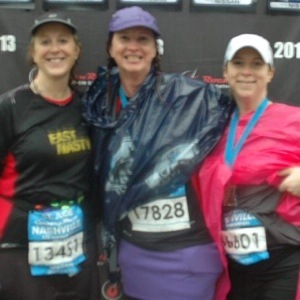 From programs you pay for, to programs where you raise money for a charity, to programs that are completely free (like the East Nasty half marathon training), to programs you do on your own – one of them is perfect for you. It’s a pricey race, but The Competitor Group puts on a quality event and you will feel such pride for your accomplishment that the investment is well worth it. The views of the city are amazing and the crowd support is humbling, even in the worst weather conditions. My favorite part of the course is the downhill stretches, when you see thousands of runners in front of you, all moving together as one gigantic running organism. I’ve run the Country Music Half three years – 2005, 2007 and 2013. Each year’s experience was memorable for completely different reasons. In 2005, I was a beginning runner and it was my first time running a really big race. Nashville was under a tornado warning the night before, which resulted in a sleepless night and a tired runner on race day. But the weather was my favorite of the three years, cloudy and cool with a few light sprinkles. I had a wonderful experience and was so inspired that I immediately registered for the Rock and Roll Half Marathon in Virginia Beach. In 2007, I’d been battling IT band problems. Race day was warm and sunny and both hips started hurting early in the race on Belmont Boulevard. The remaining miles were no fun at all. The highlight of the race was that Erika and I scored passes to the VIP tent and enjoyed both post-race breakfast and lunch. Eddie George also ran the half that year and we were hoping to see him in the VIP tent, but no such luck. We also tried to find him in his assigned corral, but had no luck with that, either. Last year, I ran with a lack of training I would NEVER recommend to anyone else. I completed just ONE long run, which wasn’t very long – only 8 miles. Typically, I follow a training schedule, building up my runs over the course of several weeks. But my friends Erika and Susan had registered in January (when it’s much more affordable), then life got in the way and neither of them had been able to do much training. Susan learned she was being transferred to Charlotte and was leaving Nashville in a few weeks. So they talked me into it under the premise that we wouldn’t actually be “running” – it would be more of a three-person movable farewell party for Susan, with running selfies and mimosas on 12th Avenue South. I have always loved a good party, so I gave in to peer pressure and signed up to run with them. On race morning, there was more rain than I could have imagined. It poured through the whole race, with some thunder mixed in. There were no selfies, there were no mimosas. There were three wet, cold women trying to make the best of miserable weather. But it makes for some good stories. Although all of those experiences were memorable, the most memorable Country Music experience of them all wasn’t one of the years I ran it, it was my experience as a spectator. Before Richard’s lung transplant in 2011, we met fellow patients Stacey and David at a Vanderbilt Lung Transplant support group meeting. Stacey has a rare lung disease called lymphangioleiomyomatosis (LAM, for short) and had a life-saving lung transplant in 2010. David (who has cystic fibrosis) was also going through the process of being listed for transplant and ended up receiving his transplant shortly before Richard received his. In going through the lung transplant process, Stacey and David quickly become close friends. In fact, many of our lung transplant friends and their families have become “family” to us. 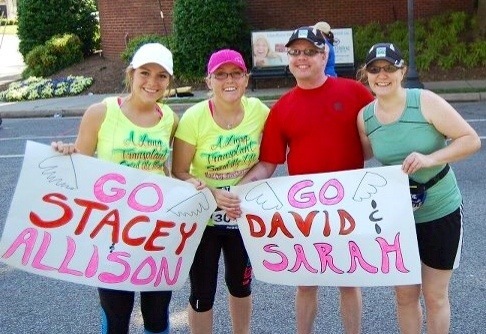 Stacey was joined by her teenage daughter, Allison, and David was with his wife, Sarah, an experienced runner. That morning, Richard and I headed for Music Row with posters and cowbell. Richard was embarrassed by my enthusiasm. I can’t really blame him – my cheering was so enthusiastic that I suffered a spectator injury -blistered fingers from cowbell overuse. We’d been cheering on the runners for awhile when Stacey, Allison, David and Sarah pulled up in front of us. There was a huge celebration when we saw them – mainly from me (I get very loud when I’m excited). Honestly, I was overwhelmed to be seeing two lung transplant patients who were so dear to me completing a half marathon. Without those much-needed transplants, who knows where they’d be now. Quite possibly, no longer here with us. But because of the selfless decision to donate life, they weren’t just alive, they were defying the odds and thriving. They both continue to thrive. Stacey is a busy wife of Anthony and mom to her two beautiful, active daughters, Allison and Melissa. She is active in both the LAM and lung transplant communities and started her own non-profit to support fellow lung transplant patients. David and Sarah are the parents of two wonderful children, Ian and Aislinn. David is pursuing a degree in Management Information Systems, while Sarah (an ESL teacher) is working on her Master’s degree. So if you’ve been considering running Country Music, but haven’t committed because the distance is too intimidating, think about Stacey and David. If these two lung transplant patients can do it, I bet you can, too! This entry was tagged Country Music Marathon, lung transplant. Bookmark the permalink.